Eileen Venn now employs the use of drones in her business, Mechanical Testing Inc.
Eileen Venn and her husband Brian have passed the 10-year milestone since purchasing Mechanical Testing Inc., a company that tests and balances the air flow and air quality of HVAC systems. According to Venn, not only has the company doubled its growth in terms of sales, but it has also recently engaged in a related side business in another technology growth industry: distributing UAVs, also known as drones. Both fields of technology might seem like a stretch for a woman whose career was distributing beer for 13 years. But her skills in marketing, training, and ad sales informed her decision to go into business with her husband, who Venn said has the trade and union experience. “Our sales in 2008 were $1.7 million and in 2018 topped $4 million, based on our sales and marketing outreach,” said Venn. Mechanical Testing Inc., or MTI, provides sustainable solutions for efficient environments and serves the Capital District over to western Massachusetts, down to Manhattan, and across to western New York. Any business in any building is a prospective customer because functional performance and preventive maintenance of a HVAC system are not only required in some industries, but are also “just good business,” Venn said. The company does work directly with medical centers, however. “The correct balance of air flow and temperature are very important in operating rooms,” said Venn. “If I can help a building not be a vampire on the grid, that’s what we can do by making sure every aspect of the system is looked at,” said Venn. Drones can do such a task with greater speed and move nimbly around air ducts and fume hoods, often saving hours or days of time and reducing labor costs. Venn said the seed of the idea came from asking the question, “Why can’t we use drones for thermal imaging?” and contacting DJI, a top global supplier of drones. “DJI created a separate department once we were approved as a distributor of enterprise drones for building envelope testing,” she said. These are not the same UAVs as consumer drones, which digitalrev.com reported may be a $21.5 billion industry by 2022. 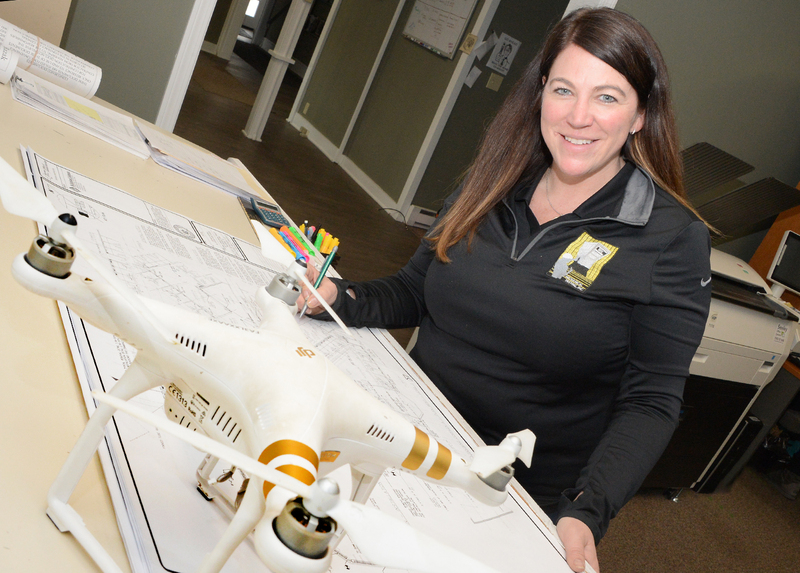 Venn believes partnering with DJI “will be a big part of MTI’s business in 10 years.” She has a dedicated employee doing training all around New York state, including fire departments, which more and more are using drone technology for search and rescue operations. “Drones equipped with thermal cameras, a spotlight and a speaker can hover over a fire and the chief can sit in his car and know exactly where everyone is and communicate with them,” she said. The drones can travel by remote control up to 30 miles per hour for up to 30 minutes, at which point they will return to have their batteries changed out, she said. Drones can also travel autonomously through pre-programmed flight plans, making them useful for working farms and college agricultural programs, another of MTI’s new distribution markets. As the 51 percent business partner Venn applied for and was successful in obtaining certification by the Women’s Business Enterprise National Council. MTI is also one of only 130 testing companies certified by the Associated Air Balance Council, which guarantees the work of its members. Venn said that if work is not performed correctly, AABC guarantees to send another company at its cost, so there is no risk to customers. Venn believes that the trifecta of being a women-owned business, an AABC-certified company, and certifications at the federal, state and local levels gives them an advantage over their competition. The field of testing and balance continues to grow with more automation, more LEEDS building construction, and more retrofitting of older buildings. “These trends are good for our company because we are all about figuring out new ways for customers to have more energy efficient HVAC systems,” said Venn. MTI now has 25 employees, including the union sheet metal workers they hire from Union Local 83 out of Saratoga County and Union Local 112 out of Binghamton, where MTI has its headquarters and its second office, respectively. “We call our union workers our employees because we work alongside them all year, whereas some trades are more seasonal,” Venn said. Visit www.mechtest.com for more information.